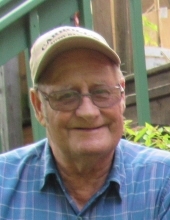 PATRICK J. MICHAUD, 79, passed away March 25, 2019 at his residence in Van Buren. He was born in St. Leonard, New Brunswick on July 26, 1939 to Lionel and Anna Michaud. Patrick was employed at the State of Maine, Department of Transportation in Van Buren for 31 years. He was predeceased by both parents and by his wife, Yvette Chasse Michaud in 2011; siblings Jeanine Michaud Vick, Ronald Michaud and Phillip Michaud. Patrick is survived by his children, Stella Michaud of Presque Isle, Ricky Michaud and wife Nancy of Van Buren, Gail Michaud of Caribou; his brothers and sisters, Chanel Michaud of Van Buren, Rita Michaud Deschaine of Florida; his grandchildren, Nathan Michaud and Alexander Churchill both of Presque Isle and great-grandaughters Diania and Lea Michaud of Presque Isle . Services will be held at St. Peter Chanel Parish on 4/13/2019 - Condolences at 11 a.m.; Ceremony at 12 a.m. Memories and condolences may be shared with the family at www.directcremationofmaine.com. To send flowers or a remembrance gift to the family of Patrick J. Michaud, please visit our Tribute Store. "Email Address" would like to share the life celebration of Patrick J. Michaud. Click on the "link" to go to share a favorite memory or leave a condolence message for the family.